Chris Somerville's Children's Show combining Magic and Punch & Judy is always delightful for the end of term treat and early bookings are especially suggested for the Christmas period when Chris is heavily in demand when everybody wants the same last two weeks of term. Similarly June and July weekends book up very quickly for Fun Days. 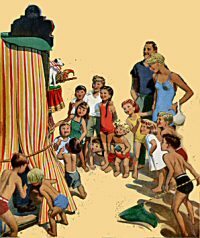 During term time Chris offers a Punch and Judy Workshop, where he talks about the Punch and Judy tradition, and how it came to be associated with the Seaside. The fascinating story of how Mr Punch came from Italy to London as a string puppet, recorded by Samuel Pepys, how he transformed into a glove puppet and became a popular Victorian street entertainment, and how he followed the crowds to the seaside can be presented at a level to be appreciated by infants or juniors, and can fit in with Key Stage 1/2 projects and be readily angled to the Victorian or Seaside theme. In one presentation Chris draws on his own memories of seaside during the 1950's, of the wonders of Steam Train travel , the mysteries of the Boarding House and the excitements of Slot Machine Arcades, the Pier and of the Beach and attendant delights of of Paddling in the Sea, Sand Castles and Shells and Rock Pools to explore. 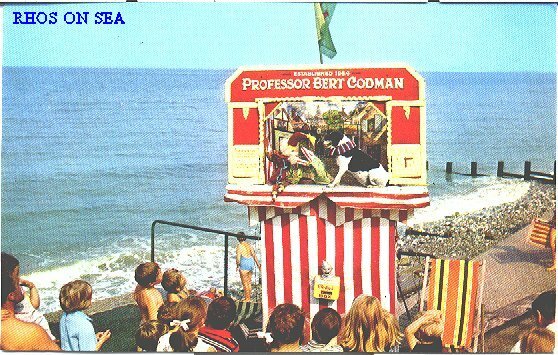 Above all he recalls his first Punch & Judy Show and how it inspired him to become a puppeteer. 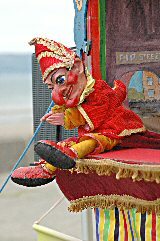 Before the pupils experience the excitement of a live performance of his sparkling show Chris shows the children the toy Punch & Judy puppets he got when he was 5 years old following his first visit to the seaside. 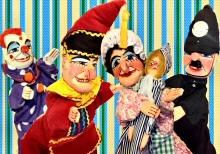 The children can handle these, together with a set of professional puppets as they learn about the traditional characters of the show. Chris demonstrates how the puppets are worked and children hold the various characters giving teachers great photo opportunities. Talks are illustrated with pictures and actual Victorian puppets, and we learn the secrets of the Slapstick and see how it is constructed. 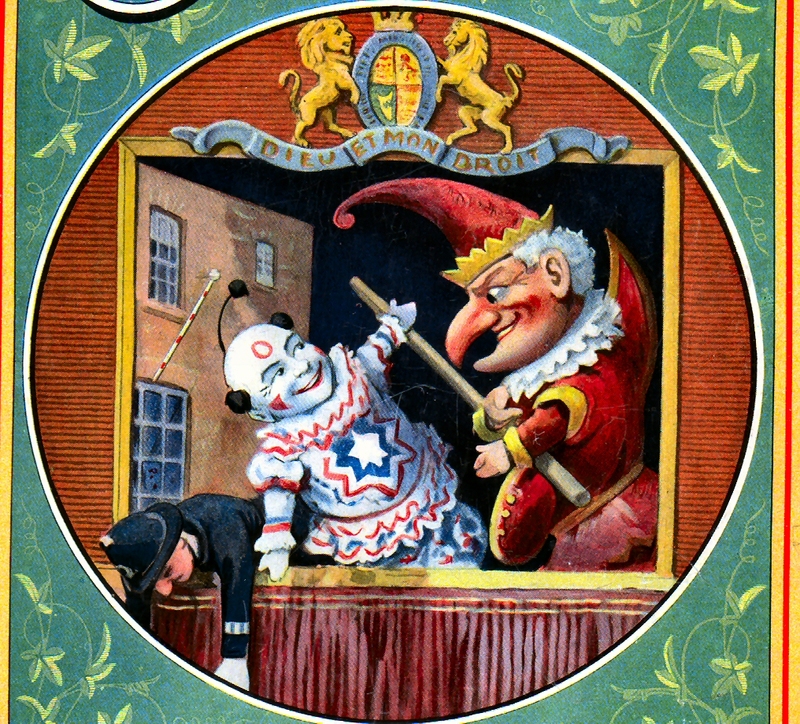 Although Mr Punch has been in Britain some 350 years the traditional Punch & Judy Show as we know it is very much a Victorian invention. 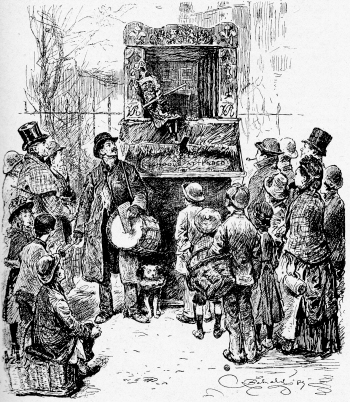 The style of puppet and presentation together with the typical booth developed to suit the needs of the itinerant street performer, and the standard characters of the show reflect the stereotypes of the Victorian streets. The most popular script, and the one all others are based on, was recorded by Payne Collier and illustrated by George Cruikshank and was published and re published many times throughout Victoria's reign. 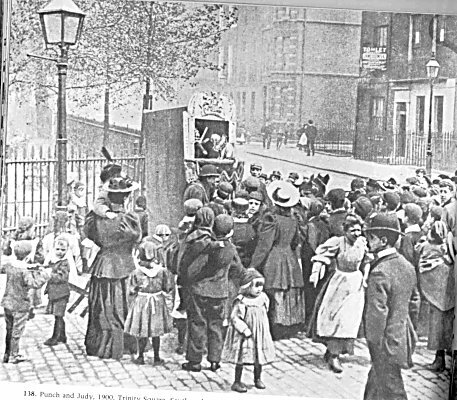 The street Punch & Judy Show was a product of the growth of the industrial towns and the travel of the show to become an icon of the British Seaside is directly linked to the Victorian development of seaside resorts. 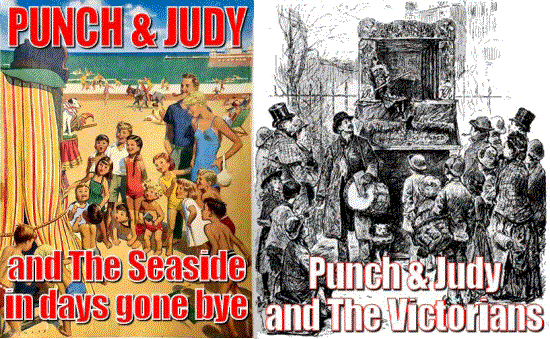 The rich and varied links of the Punch & Judy Show with the Victorian street life and subsequently with the British seaside gives opportunities for creating interesting and entertaining workshop presentations, culminating with a hilarious performance, which have proved popular throughout the Primary School and Chris has successfully enthused infants with Seaside Holidays being their topic, as well as older children who are doing Victorian Studies. As a successful Children's Entertainer of great experience Chris can readily adapt to ability and vocabulary levels of different age ranges.